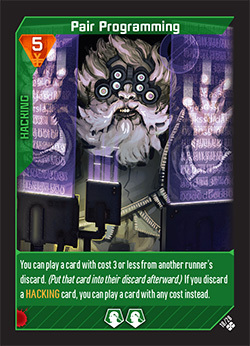 In the Shadowrun: Crossfire adventure deck-building game, the Decker is all about data. We hack into terminals to bypass security and search the Matrix for that crucial piece of intel. Unlike a Street Samurai and their ability to protect your back in a fight, the Mage with their arcane wisdom, and the Face who seems to always have “a guy” for anything, I’m the true master of information and technology. You want the latest tune before it’s released? I’m your man! I’m also the guy to get you through the door, disarm the security systems, and retrieve the megacorps’ most prized information. The Decker’s role color is green and the green cards are all about fun combos. Get the right set of cards in hand and you can do some crazy damage. Some of those combos are easy and basic, such as Icon Grab. Play Icon Grab with another Hacking card and you get 2 damage out of the card instead of one. Plus that second damage gives you a choice of colors, which can be critical for knocking out pesky obstacles in your way. 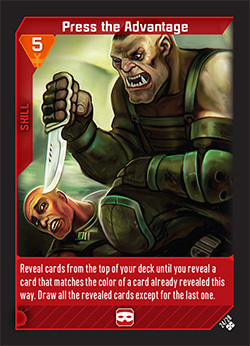 The next card, Retrieval Agent, is also fun to combo with. 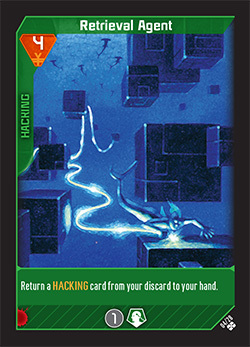 Using the Retrieval Agent card allows you to bring back Hacking cards you used in previous turns. Remember that cards played this turn don’t go into the discard until later, barring effects that have discard a card as part of their cost, such as Pair Programming. Pair Programming lets you play with the other runner’s discards. And to combo it with Retrieval Agent, discard a Hacking card to use Pair Programming on an expensive card, and then play Retrieval Agent to put the card you discarded back into your hand. What was that? You want to play with your own discard pile? For that we have Jacked In. When you play Jacked In, it just does its damage. But once it’s in your discard, you can get it back by discarding another card from your hand. This is a great way to upgrade the damage from a basic card, or a good option if you only have a red card in hand and you need to do additional green damage. Because Jacked In can provide a constant source of green damage, it’s very popular with non-Deckers that want to interact with the Matrix. 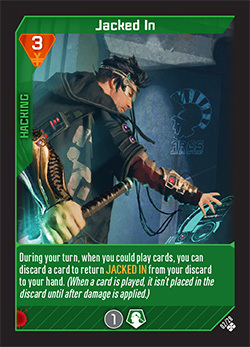 Don’t expect to use Jacked In more than once a turn, however, because after you play it you’ll have to wait until the end of your turn for it to be in the discard. Played normally, it does a hefty 2G damage. But play it on another runner’s turn and you get the assist ability instead. Played that way, you can cancel the ability text on any obstacle and deal G damage. It’s perfect for neutralizing obstacles that can heal or that place restrictions on your team. 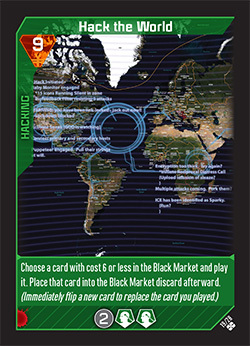 Finally we have my favorite Hacking card—Hack the World. You get to reach into the Black Market and play something for free! On top of that, you get 2GG damage as well. The card gives you the ultimate flexibility since you can usually get exactly the card you need for any given situation. Well, we’re back. Look’s like no one else has shown up yet, so I think it’s time to dig into some ramen! Crossfire: Not in the Face! Why can’t I find a spoon around here? Sure, it’s a beat-up, boarded-up, ransacked house, but you’d think there would be an old spoon laying around. I guess not. I’ll go back to that convenience store where I bought my ramen, and along the way I’ll tell you all about being a Face. 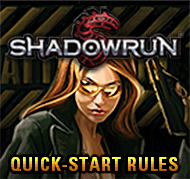 The Face is the Shadowrun: Crossfire role with the people skills. While a Decker hacks into a terminal and searches the net for data and the Mage uses Arcane wisdom to come up with obscure info (and the Street Samurai looks for a fight), the Face is talking to their friend just around the corner to get that crucial piece of intel that will make the difference. The Face’s role color is Red and playing the role is all about cooperation and increasing your options and those of the other runners. 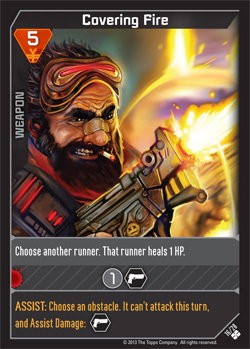 It also has one of the best healing cards in the game—Doc Wagon Contract. It’s such a good card that it works well in anyone’s deck. 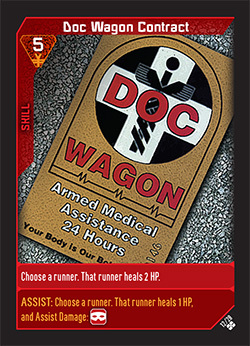 It’s usually better to spread Doc Wagon Contract cards around rather than having one runner keep them all. That way no matter which player becomes staggered there always another player that can patch them up. 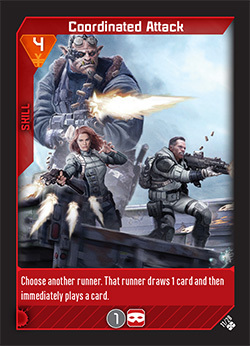 And speaking of more options, one of the best group cards in the game is in red; it’s called Hero Move. Hero Move is all about teamwork. It does a lot of damage but more important is the fact that it gives every runner another card outside of their normal draw step. 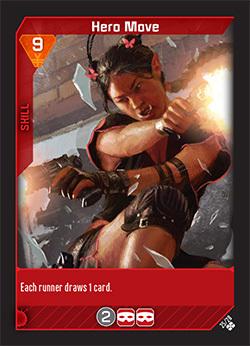 And more cards means more options on what a runner can do on their turn. And if that isn’t cooperative enough, Coordinated Attack should do the trick for you. 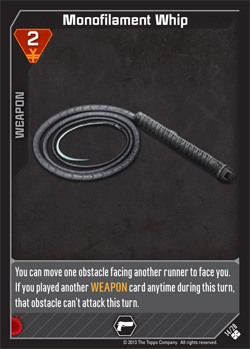 This card allows another runner to not only draw one more card, but then play any card from their hand (even the one they just drew) on your turn. If multiple runners have Coordinated Attack cards in hand, it can do some crazy (and fun) stuff. This card allows you to draw a bunch of cards (sometimes) and rewards you for building your deck with cards from other colors. One trick is to keep 3 Street Smarts in your hand so your deck isn’t stuffed full of red cards. Then when you play Press the Advantage, you improve your chances of not drawing a bunch of red cards that would cut your card drawing short. The next two red cards are about Black Market manipulation. If the Decker gets lucky, they can hack into the Black Market and maybe apply the digital five-finger discount. But the Face uses the art of negotiation to get huge discounts nearly every time. The main ability on this card allows you to buy a red Skill card for cheap. 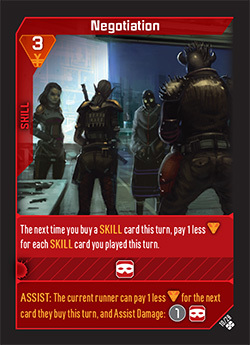 Keep track of how many red cards you play on your turn, and that’s how much you can discount your first Skill card purchase from the Black Market. So a red-heavy deck really makes this work. Negotiation also has a good assist ability, and actually does more damage when you use it as an assist, because it lets the runner you play it on get a discount of 1 nuyen when they want to buy a card. And finally we have . . . This card allows you to buy something immediately instead of waiting until the end of your turn. 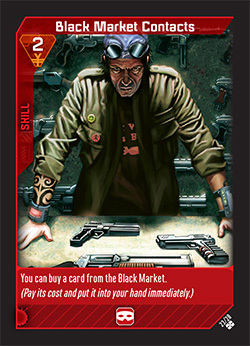 It essentially makes the entire Black Market part of your hand (well, if you can afford it). And on top of that you can play the card you bought during the same turn, which can be really useful for finishing off that pesky store clerk that didn’t give you a spoon with the cup of noodles you bought. 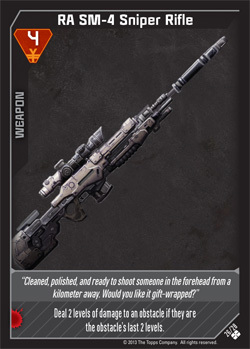 The last thing that I like about this card is its usefulness when you’re in danger of being staggered. Usually that means you end up with money you can’t spend as you get knocked down before you can buy from the Black Market. With Black Market Contacts in hand, you can spend before you bite it. And who knows? That card just might save your hide for another turn! Well, I don’t have black market contacts, and the store clerk is being belligerent about giving me a spoon. Let me deal with him and then we can go. Oh, and bonus karma for getting the reference in the title. If you attended Origins you might have run into Rob Watkins, a member of the Crossfire design team, giving nonstop demos of the game. Rob was using a prototype of the Shadowrun: Crossfire Demo Box. The Shadowrun: Crossfire Demo Box is a trial version of the game that’s perfect for learning the rules. We carefully picked out a subset of the full game that shows off Crossfire’s feel and mechanics in a small, elegant package. The demo box takes you through a shorter, tighter version of the “Caught in the Crossfire” mission included in the full game—it’s the quickest way for new players to learn how to play. 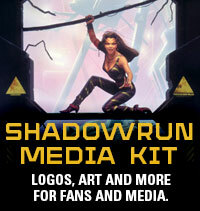 We’ll have more people demoing Shadowrun: Crossfire at Gen Con and PAX Prime, but that’s not all! 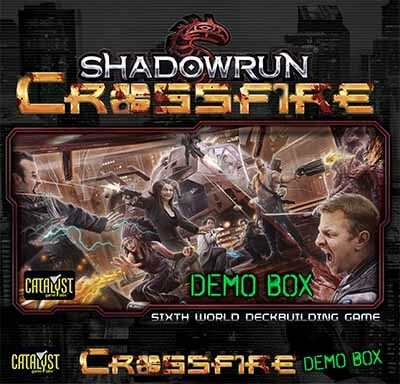 In addition, we’ll be making demo boxes available to retail game stores across the country once Shadowrun: Crossfire launches. 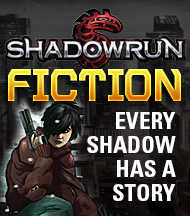 Gamers: Once you see details on our site letting you know Shadowrun: Crossfire is nearing a Street Date, let your favorite local game store owner know that you’d like them to order a demo copy! And one final note. The demo boxes are only the beginning. 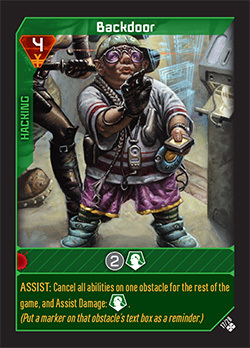 We will be sending out materials and encouraging game stores to hold Shadowrun: Crossfire game nights—the demo box is the jumping-off point for the Crossfire fun to come. Stay tuned! Sure the Street Samurai can deal a ton of damage—it’s one of the top damage dealing roles in the game. But the role also has many other tools it puts at your disposal. So how do you deal damage as the Sammy? 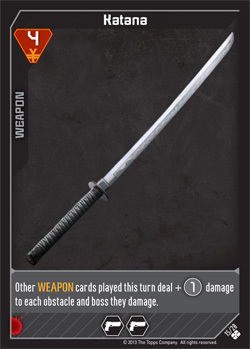 By playing Katanas with other weapon cards. A simple combo that’s fun to play. Katanas also stack with each other, so buy lots of them if they show up. The problem is that your damage is all black and colorless and there are very few obstacles you can defeat with just that type of damage. This color-focus is the Street Samurai’s weakness, but you can do something about it and still stay in your color. The Sniper Rifle doesn’t care what colors are left on the damage track. It clears the bottom two levels of the damage track regardless of what those symbols are. BAM! Headshot! You can always buy cards of other colors as well. 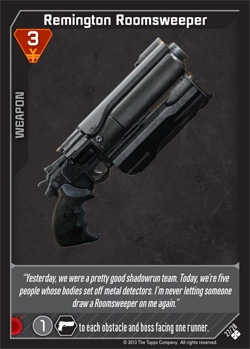 Shadowrun: Crossfire has many cards that work well in other colors, so don’t be shy about buying them. Of course, that means the other runners will be buying your color of cards, too. The game works well with a little diversity in your deck. Another main focus of the Street Samurai role is taunting obstacles so they will face you. You do this by playing Monofilament Whip. As you can see, it’s even better when you play another Weapon card: you move an obstacle to face you and then it deals no damage to you. This is one of the best ways to keep your teammates going, but you have to watch out. You can’t use the Whip on your own obstacles, so next turn you’ll likely have a lot of trouble facing you. . . .
. . . which is the perfect time to use the Remington Roomsweeper! It does its damage to ALL the obstacles (and bosses!) facing a runner. So whip ’em good, then Roomsweeper them! Note that if you use this combo with a Katana, the extra damage from the Katana applies to each obstacle that you damaged with the Roomsweeper, giving you major damage! Healing in Shadowrun: Crossfire is scarce. 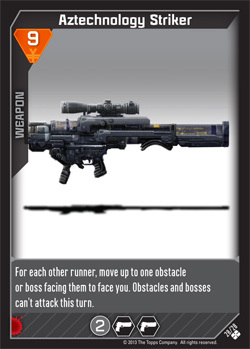 But Black does have one healing card in its color: Covering Fire. When you play it on your turn, you can heal a runner . . . but not yourself, so be careful when whipping obstacles to you! It also has one of the most powerful assist abilities. You can only play assists on another runner’s turn to help them out. In the case of Covering Fire, it completely prevents the damage done by one obstacle. If that isn’t enough, it also provides a damage. The assist on Covering Fire is very powerful, so you might have to think twice about using its normal ability. And don’t be upset if someone else buys this card. It’s great for anyone’s deck! And finally, there’s the rare Aztechnology Striker. This is the biggest, baddest Weapon there is! So everyone will want it, even though it costs so much. It does a base of and 2 damage. But its real power comes from being able to move a bunch of obstacles to face you and have them all deal no damage. It’s one of the best ways to recover from a losing situation, and it can single-handedly allow your team to successfully abort, if the run has gone really sour. So there you have it. The arsenal available to the Street Samurai is powerful and simple to use. Have fun blasting and slicing your way through the streets!